Model T Ford Forum: When was your T last inspected? When was your T last inspected? Model T Ford Forum: Forum 2018: When was your T last inspected? When I bought my Model T last year, the gentlemen selling it pointed out the original inspection sticker on it. It was last done for 1937-1938. A time when there was only four rules to driving! - Don't drink and drive, come to a full stop when entering a main thoroughfare, never fail to dim headlights and never pass on a hill! When was your car last inspected? Does anyone have a Model T that made it up through the 50s as a registered vehicle? My 27 T was registered from 27 to 47 when it was parked in a woodshed until our family bought it in the early 60's. It has been registered ever since and inspected almost every year since inspections became mandatory in this province. To my knowledge, mine has never been inspected. Minnesota only had an inspection law for a few years, and my T was not on the road during that period. I would guess that most have never been inspected except by the owners. Most states don't require any safety inspection. 32 require emissions inspection. The only time Minnesota required an inspection for passenger cars were the emission inspections from 1991 through 1999. No classic inspections in N.J. The modern inspection is crap anyway. They sure as hell wouldn't know what to do with a T.
Here in Ca. We only have smog equipment check for vehicles 1976 and newer. No safety checks at all but some cars could sure use it. Three weeks ago as is required here to get a license plate. Every 6 months down here. 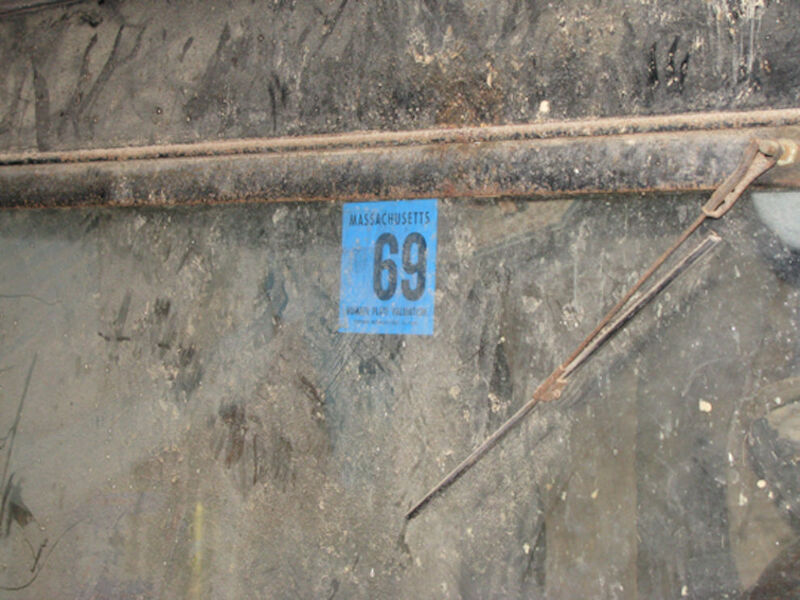 My son's 1926 roadster had this 1958 inspection sticker on it. I don't think it ever sat idle for long because all the mechanical parts of the car were worn out. Georgia used to have a required safety inspection. In the early 80's, we lived just across the line in AL, but had friends in GA. One told my Dad he went to have his modern car inspected. They had him pull in the bay, blow the horn, turn on the lights, turn on his turn signals. Mechanic signed off on a form and handed him his windshield sticker. What a farce! Guess the legislature figured it out, too. I don't know when, but they have subsequently stopped doing them. Guess they're kinda like having a blood test for VD before issuing a marriage license. Does any state still do that? Again, what a farce! Yesterday by me! by the State never. In New York State we have inspections once a year. They include emissions, brake condition, tire tread, lights etc. My local shop just asks me if everything works that came with the car and if I think the brakes and steering are as safe as possible given the technology of my car. Costs about $12 and they put a sticker on the windshield. 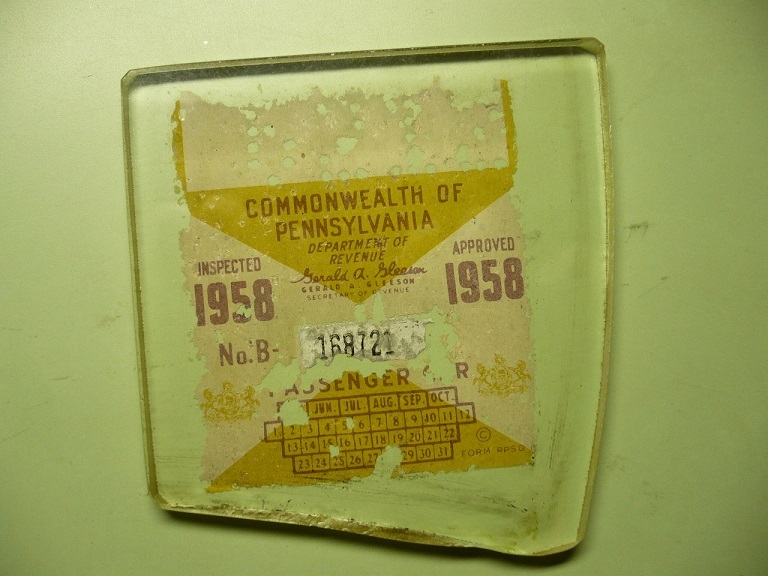 Was Pennsylvania the only state that required annual vehicle inspection back in the 20s/30s? We have regular smog inspections here in California, but not in my county. Nevertheless, when I finally get a "bitsa" T assembled, I look forward to some interesting times getting it licensed. Provincially, never, Owners at Club 'spring safety check' . . yearly using MTFCA's form. 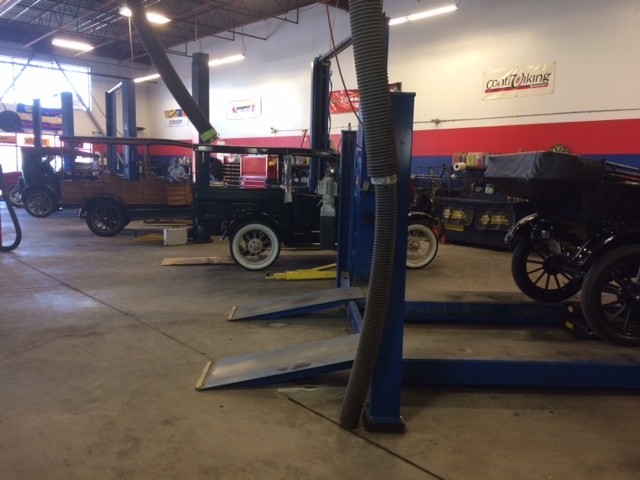 The province does require an "out of province" inspection if one is brought into province and registered, but only a few Model T member / mechanics will do it. I wonder how a Model T would do on a modern smog test. 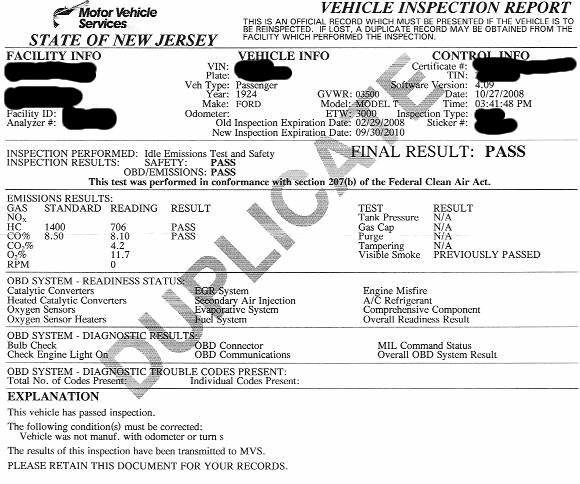 Our last NJ statue inspection was in 2014 - NJ has since eliminated inspections for all older cars. The inspection was both for safety and emissions - all cars with regular tags from 1968 and back (including our 1924 Model T) had to meet the same emissions standards. We took the car to the state inspection station and it was quite a scene, particularly the first time. Here is a copy of one of the inspection reports with the emissions results. If it ran decently and the mixture was not too rich, it would pass the emissions test. Dale I have a 26 coupe with a 1954 Pa inspection sticker on the windshield I took out of the car to replace it with safety glass. The car came out of Philly. 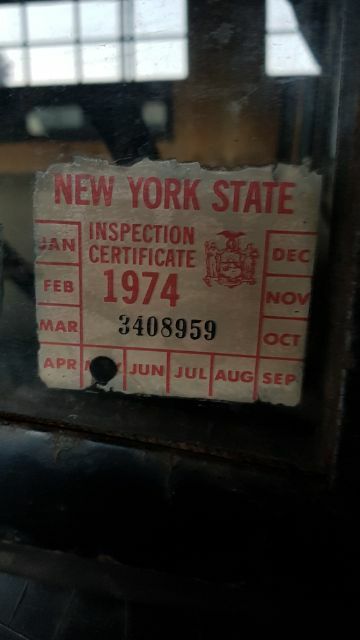 I Live in South Jersey and if you have QQ tags for antique cars it is a self inspection process. I you do go through the "state station", which are run by a private company, it is only the a emission test. I doubt if our '21 Touring has ever been inspected. It came for Tennessee when we bought it in October of 2016. Tennessee does not have safety inspections unless they have started in the last few years. I was told our car had not been on the road since 1969 so it would not have been inspected in Tennessee. The People's Republic of Massachusetts requires every vehicle get inspected every year so they can collect their $35.00 fee. Every time i go in i basically have to instruct them on what to do, as they usually have no clue about how to deal with a car this old. When i hand the Registration to the guy at the counter i tell him I'll have to drive it in because nobody here knows how to drive a T,..he just nods O.K. Next i drive it in, turn on the lights, and beep the horn, that's when i tell him that's all I've got. Bewildered, he takes my money and i go on my way. My most popular post on facebook is always a description of my yearly visit to the state inspection station. They always five the job to the newest guy in the garage. While we have no inspection, I have seriously considered taking one of my antique cars to one of the oil and lube places just for fun. Reckon they would fill my grease cups and oil the oilers if I showed them where they were? Seems the least they could do considering they saved money on the oil filter and 5th quart of oil they are going to charge me for. Last year it was on the road before I picked it up in 2010. Here's the inspection sticker on my coupe! Sticker? mine blew out the windshield 2 yrs ago.